Part of a collection of wooden toy car plans. Inspired by the cars built in the 1930's, this single seater sports car features a rumbler seat for an extra passenger. This sporty little toy car measures about 315mm (12.4 in) long, 160mm (6.3 in) wide and 115mm (4.5 in) high. The project is simple enough for beginners, yet interesting enough for toy makers with a little more experience. The challenge is in the method of construction. 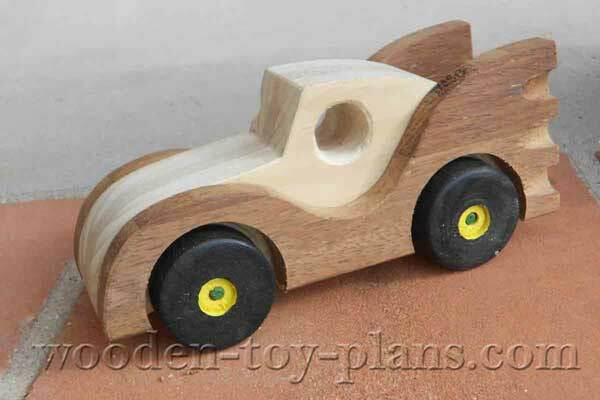 Making toy cars is a lot of fun, they can be very simple profiles cut out with a band saw with a set of wheels attached. 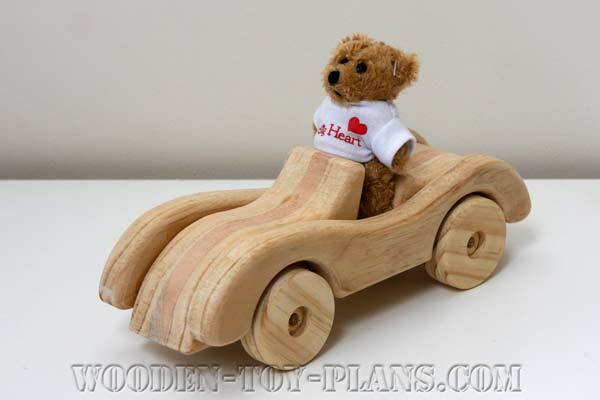 A free copy of the wooden toy car plans is available for downloading. This file contains the full size templates for the body parts, chassis and mudguards. Step by step instructions with photos are also included. Simply print out each template page on your home printer, making sure the scale is set 1:1 or full size. 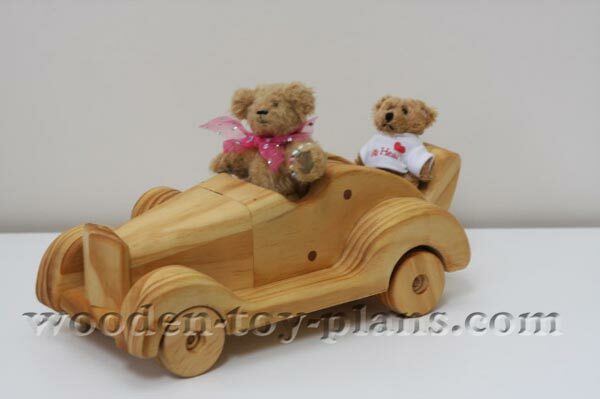 This wooden toy car has been designed to used project timber available from your local hardware or timber supplier. 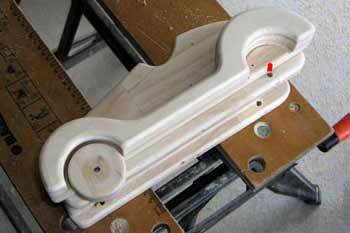 Also known as one inch wood, or white wood it is ready to use for a project such as this. Most woodworkers and home handyman already has most of these tools. Disclosure: I do earn a small commission from eBay if you happen to buy something. This helps me to create new wooden toy plans. , also known as a back saw. Some would say most of the pleasure of making toys is having the right tools to use. Everybody is different, some people would be happy to use the most basic of hand tools. A router mounted in a router table is nice to have, but not essential to the completion of this project. Likewise, I find a 12 inch disc sander very useful. A drill press is also beneficial for making wooden toys, for drilling holes accurately for wheels and other moving parts. This is a preview of the building instructions which is part of the download package. 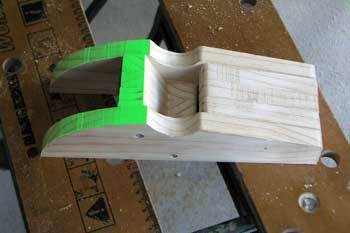 The photo shows the parts A to D cut oversize, ready for gluing. 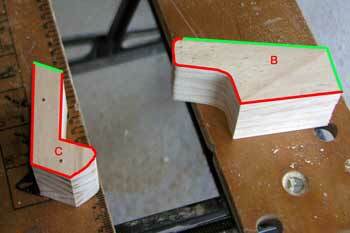 Parts B, C and D are laminated and cut to the final shape once the glue has set. 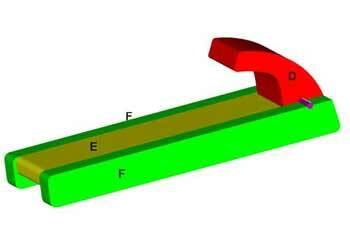 The red lines indicate the reference lines for assembly and lamination. Showing parts B and C laminated. The green lines indicate the areas to be left rough at this stage. These areas are cut smooth in the next step. Showing the two sides fixed in place. Once again, the are shaded green is left unfinished at this stage. Drill a pilot hole in part D. Nothing too complicated here, except to mention that it should be perpendicular to ensure the smooth rotation of this part. 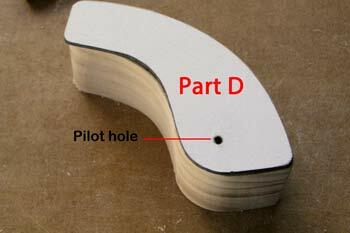 Position part D in the body sub-assembly, and mark the position of the pilot hole as shown by the red line. We will use this mark to drill the hole for the hinge pin when the chassis is fixed in place. 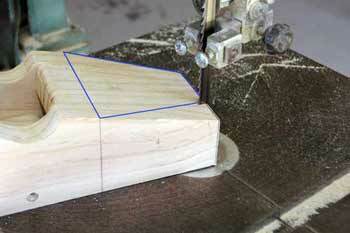 The blue line indicates the shape of the bonnet to b cut out in the next step. Cutting the bonnet with a band saw. You could use a tenon saw instead. Sand everything smooth and round over the top edges ready for assembly. The chassis sub assembly in glorious technicolor. Note that the width should match the bodywork. 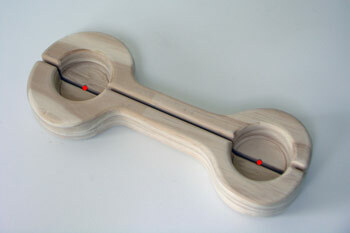 Part D, shown red, is in position with the hinge pin in a complementary shade of purple. This is purely for illustration purposes, the hole for the pin will be drilled at a later stage. Be sure to leave a small gap between part E (yellow) and part D (red) to allow it to rotate freely. Fix the chassis to the bodywork. I used four wood screws as shown by the blue dots. 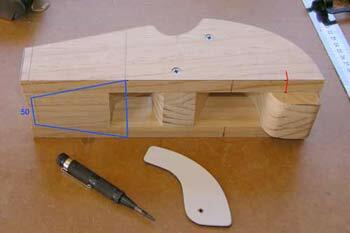 The red dot on the side indicates the hole for the hinge pin, as located in step 5. Drill the hole and fit the rumbler seat. No doubt it will be a bit tight, so we need to shave a bit off. Check for movement and adjust accordingly. 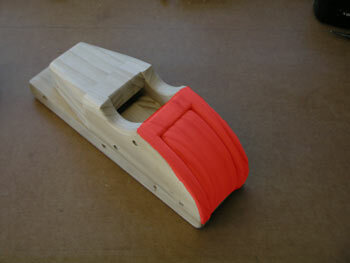 With the rumbler seat in place, the area shaded red is sanded smooth, and the seat is rounded over. Now make the mudguards using a template. 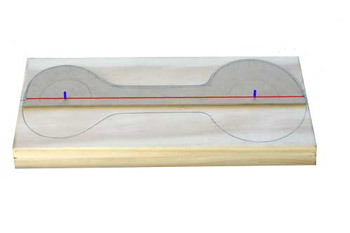 The red line indicates the centerline and the two blue lines are a pair of nails holding the template in place while tracing the outline of one half. Flip the template over to create a mirror outline, using the holes left by the nails. These holes will also be used for cutting the wheel arches in the next step. Using the modified circle cutter, cut a hole through the first layer. 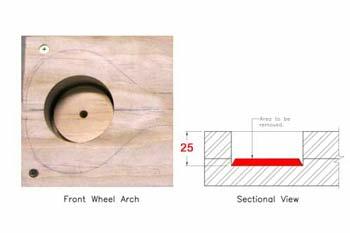 This will make a wheel, and also leave a v-shape groove in the layer below, which needs to be removed. 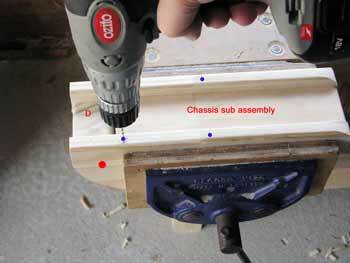 Now, you can use a router to do this if you have one, or use the old fashioned method with a chisel. Cut the assembly in half along the center-line. Round over all sides with a 1/4 inch (6mm) router bit. The red dots indicate the hole made by the circle cutting. These indentations are going to help locate the holes for the axles. Fix the mudguards in place and drill the holes for the axles. 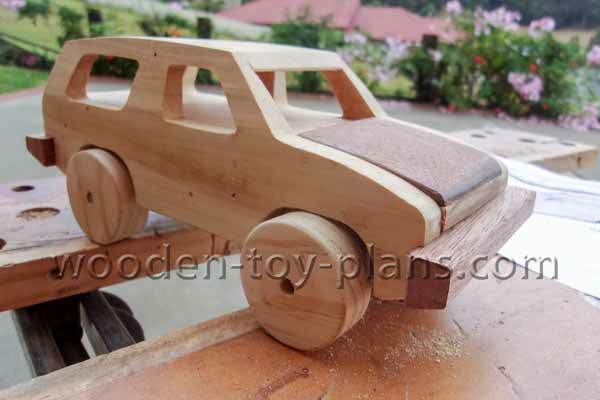 Download free wooden toy car plans.